I’ve been looking forward to writing this post much more than I usually do. You see, I’ve got a story to tell. Triumph over adversity. Never giving up. That kind of thing. Stick with me a moment, I think you might like this. Deep in the summer, I got a phone call from Patricia, my wife. Sam’s favourite band in the whole world had just announced a gig in Dublin in the Autumn and he was really, really keen to go to it. Sam is the younger of my two sons, just turned 16. He is an avid music fan and a talented drummer. The band was ‘Death Grips’ and it was an easy decision to make. Sam loved their work, knew every song, every twitch they ever made. It was a simple no-brainer. Sam had to go to the show. Except, of course, it wasn’t simple. It really wasn’t simple at all. Death Grips were playing the Academy in Dublin and the Academy in Dublin is a licensed premises which means that persons under the age of 18 are not permitted inside after nine o’clock in the evening. Death Grips were playing a Strictly Over 18’s gig and Sam was only 16. I explained it to Sam, how it was quite likely that he wouldn’t get in, that he would be turned away at the door. He took it all on board, he understood, but still he wanted to go. His rationale was simple, they were his favourite band, he had to go. So we got the tickets. Three in all, one for his older brother, John, one for John’s friend Mike and one for Sam. The idea was that the two older boys would provide cover for Sam on the way in and hopefully ease his access. We also borrowed an ID card from a just-over-eighteen pal who looked a bit like Sam in his photo. Sam memorised the date of birth on the card and we got him a haircut to make him look a bit older. On Thursday last, at two o’clock, it was time to make the four hour drive to Dublin to see the show. A word about ‘Death Grips’. 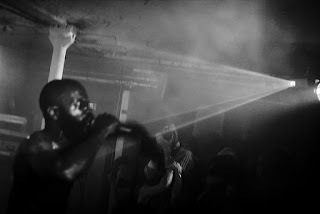 ‘Death Grips’ is an experimental/industrial hip hop group from Sacramento, California, formed in 2010. They have a highly dedicated following and they play hard, sharp gigs which have received considerable attention for their wild physical performances which, almost literally, blow their audiences away. The band members remain extraordinary elusive. They do not encourage photographs, they do not sign autographs, and they generally do not engage with fans or public in any way. They simply come in, blow the room away, then leave. No encores. As soon as I saw the queue for the concert, I knew we could not succeed. Sam and I had driven all the way for nothing and we would drive home the same way. As the three boys joined the back of the queue, I stood some distance away and watched and waited for the inevitable. The main man on the front door was scrupulous. Every single person who came past him was examined and questioned whenever there was even the slightest doubt. IDs were meticulously checked and anyone who was even suspected of being below age was unceremoniously turned away. John and Mike and Sam got to the man on the door. John was fine. Mike was fine. Sam was not fine. “You’re not going in.” he said. The cordon rope was lifted and Sam was eased outside of it. No entry for him. This was doubly hard, triply hard, on account of what happened the year before. You may recall we were all set to head off on a (for us) wildly extravagant trip to London to see Foo Fighters at Wembley Stadium. Our bags were packed and we were ready to go when the concert was cancelled on account of Dave Grohl’s broken leg. That was Sam’s Christmas present that year. That was his first ever gig. ‘Death Grips’ was his second ever gig. Once again, it wasn’t going to happen. We tried everything known to man. In case you’re angry with me for trying, can I just say that Sam had no interest in alcohol or breaking any laws or conning anyone out of anything. He just wanted – needed - to see his band. Regarding the man on the door, who I spoke to at length over the next hour. He was one of the kindest, most amenable men I have met. Every question I asked him, every point I made to him, was met with a reasonable and friendly response. He never lost patience with me and was never anything other than approachable and kind. He was also a completely immovable force. Sam was not going in. For my own part, I was also never anything other than friendly, that is my default setting and it would have been difficult to have been any other way with the gentle giant of a man. I told him about Sam and his passion for music in general and this group in particular. I told him about Wembley and Foo Fighters. I even showed him a video on my phone of Sam drumming. He watched with interest, all the time turning away belligerent drunk people with a flick of his wrist. An amazing man. One exchange we had perhaps sums up all of the others. Me – I’m not trying to con you or cheat you or anything, I hope you know that. Him – I know that. I know what you are. You’re just a Dad trying to get his son into a gig. But it’s a licensed premises and, by law, I cannot let him in. There is just no way. Eventually, after many and varied attempts which I won’t bore you with, I had to give up. That was no problem. We stayed on the street at the front door and listened as the band came on stage. Faintly, we could hear the songs being played. Sam knew every one. He stared at me quite hard then. He moved away and got on his radio, talked briefly, then came back. We agreed, thanked him profusely, and headed off to find the stage door. This was great. Except that Sam knew this band a lot better than the kind man at the door did. This band did not ‘do’ photos and they did not ‘meet’ people. Still, something had been given to us and we had to make the best of it. We discussed it and we agreed that, on the off chance that we could see the band, we should be ready for it. We practised taking rapid-fire selfies in the alleyway by the stage door. Then I had another idea. “The ticket?” We still had the ticket. We really needed a permanent marker, just in case. But where do you find a permanent marker at 9.30 pm in Dublin City Centre? We went to the only two shops we could find, a chemists and a sweet shop. Neither could help. Then Sam has his Inspired Idea, he threw it out there tentatively. There was one in O’Connell Street. It was empty, the lady was just closing up. We explained that we had the chance to meet our favourite band but we needed a marker for an autograph and could we please buy a marker off you? She gave us one for free. A real permanent marker. We were all set. All we needed was a chance. The set ended at 10.20 precisely. There was no encore. We know this because we were all alone in the cobbled alleyway at the stage door listening at the crack. Even after the gig ended, nobody else came to the stage door. The band’s reputation preceded them. They don’t do photos, they don’t sign. After a while, John and Mike and their friend Matthew joined us from out of the gig. They were sweaty and deaf and tired and it must have been hard for Sam to see them but we were focused on our own prize now. The chance to at least see the band as they ran out. Sam rehearsed in his head what he might say to them, if he only had a moment to do so. Mike had to go but John and Matthew stayed. Matthew was another huge Death Grips fan. I had never met him before but he said to me, “I’m only staying to see if I can help Sam meet the band.” I had no idea how much he meant that but I was going to find out. At one point a man came out and we chatted to him. I think he was the band’s manager. He was sorry to hear what had happened to Sam. He told us 6 year olds regularly come and see the shows in America, where there no alcohol. It was a shame that Sam couldn’t have got in. I said we were hoping for perhaps a quick photo or something… He smiled at Sam. The look on his face was kind but far from hopeful. Time passed. We waited. From time to time, the man from the front appeared and disappeared, apparently not succeeding in getting any access for Sam. “Are they still inside?” I asked him. Empty bottles came out and were dumped. The back of the place went dark. After a time, it all seemed over. Sam and I discussed our small consolation. We had come, we had done everything we possibly could. We had tried, damn it, we had tried. A taxi/van with a side door pulled right up to the one remaining unshuttered stage door. There was only about three foot between this car and the door. We were across the cobbled lane so the entrance was now completely blocked by the van. We ran across and stood at the front bumper of the car. The stage manager was there and the man from the front was there too. All the players in the evening’s story were there. The band came out and jumped straight in through the side door of the car. Beside me, Sam tensed in amazement. There they were! That was it. At least we has seen them. Sam was smiling and quite in awe. At least there was that. I’ve thought about what Matthew did next. I’ve thought about it quite a bit. The best way I can describe it is that if Sam was Robin Hood at that moment, then Matthew became Alan-a-Dale, a troubadour at his shoulder, boldly telling his story. The side door of the van was still open. The three band members were sitting inside looking out, they seemed completely engaged in Matthew’s extraordinary telling of Sam’s story. “We sorry to hear that,” one of the band members said. Sam knows which one. There was a moment’s silence. Nobody quite knew what to do. I was quite close to the door of the van, to the band, I don’t really know how I got there. Everybody knew me by now and I guess I wasn’t very threatening. I spoke quietly to the lead singer. “He has a T Shirt on, one of yours. Would you maybe sign it for him? I have a marker." There was another silence. The impression I got of the band was very strong, it was one of three extremely shy guys who didn’t like any of the Melee that goes with their job, their art. This is ironic, perhaps, given the absolute mayhem they unleash while on stage but it is also remarkable and rather good. They are strong enough to be themselves. To never-ever compromise on what they believe. Then Andy, one of the band members, spoke up gently. “I’ll sign it,” he said. Sam was quickly encouraged to tear off his coat and his sweater and then, astonishingly, he was brought into the van with the band. Face to face, Andy grabbed him by of his both shoulders and spun him around with some force. Sam laughed and the guy smiled to himself behind his back. It was a moment that, for me, told a story. I’m still trying to figure out exactly what that story is. The guy took a long time drawing carefully on the back of Sam’s T-shirt with the Starbucks marker. When he was done he nudged the band member beside him, “Sign this” he said and he did. Again he drew a distinctive and careful signature. The final band member, the front man and the most famously reticent of them all, then also took the marker and added what Sam afterwards described as ‘two hard swipes’ on his back. This later transpired to be a rather intricately-formed pentagram. As they were all carefully and painstakingly signing the shirt, Sam spoke to them, saying all the things he had thought about before, telling them what their music really meant to him. He got it all out and they heard him. Then we were done. We wished them a good night in Dublin and Matthew wished them luck on the rest of their tour. Matthew, a huge fan for many years, had completely given up any possible shot at interacting with the band to enable Sam to have his time with them. It was, without doubt, one of the more selfless things I have ever seen. On the long drive home, Sam spent more than an hour writing on his phone. On his brother’s advice, he was setting it all down so that he wouldn’t forget any of it. I hope these words might help with a little with that too. The T-Shirt is now a Beautiful Thing. It will be framed and cared-for and treasured forever. My sincere thanks go out to Death Grips, for setting aside their rules for one young man who needed them just a little. My thanks, too, to the Man on the Door who only smiled at the last when I shook his hand and asked him for his name. The kindest immovable force I have ever met. Lovely story, Ken. Best, PBD. That made me cry a bit! Well done to you all! Ken, what an awesome story. My teenage idols were Madness and I didn't get the chance to see them until I was long toothed and in my forties. It was still magical. I now regularly chat to Mark Bedders Bedford on twitter about when we turn our central heating on. I'm still awestruck. Good on Sam for fulfilling his dreams a lot earlier than I did. Thank you Ken. Thank you very much for a good story, very well told. And I love knowing that there are people like that in the world. I love this story! Thanks for sharing it so vividly! Christ knows who said it first—it’s nowhere near as old an expression as you might imagine (it seems to have originated in the 1970’s)—but whoever it was hit the nail on the head when he (or she?) said, “Never meet your heroes.” The stories of how disappointing that can be would fill several volumes I expect. (My first wife used to tell a story about the time she was almost knocked over by a drunken David Cassidy.) The only hero I ever met became such during the meeting so I’m not sure that counts (I’m talking about William McIlvanney here) and I resisted the urge to see him in later life once he’d become a national treasure although from all accounts he remained very much the man I’d met in my teens and didn’t develop a chip on his shoulder. I can understand why the members of Death Grips might shy away from publicity and it’s to be commended. The trade in celebrity memorabilia is a roaring one even though oftentimes the provenance is questionable and I have an image in my head (from a film I expect) of an old and suitably ugly woman signing and kissing photos on behalf of some starlet before mailing them off to her fans. The only time I’ve ever been tempted to go down that path was when I once chanced upon a signed photo of Woody Allen in a market in Glasgow. The price was exorbitant—and I am a stingy bugger—so I passed on it. I do, however, own two signed copies of novels and both have mistakes in them. Jeanette Winterson got my name wrong and wrote an apology afterwards and Gerald Murnane got my city wrong (he wrote ‘Edinburgh’) but they’re both genuine. Such a heartwarming, and at the same time, heart-rending story. Sad and beautiful. Thanks for sharing it with us. It shows that there are still caring people around. And kudos to your son, who never gave up on his dream. Dreams can indeed come true - even in a different manner. Thanks for restoring my faith in the kindness of others. Sam has a cool Dad!